The operation principle of the Return Bender Cleaning Machine, use stainless steel ball as abrasive, through vibrating and grinding get rid of burrs and wash, the clean minor elbow enter into vibrating chute in queue with two feet towards down. Drying by heat wind, separate grinding steel ball. 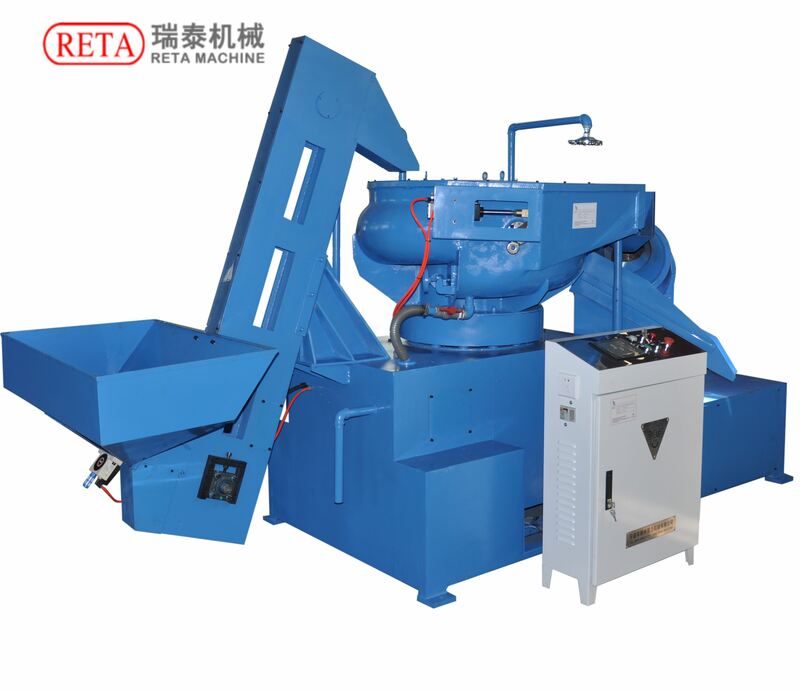 For the storing chute position of Return Bending Cleaning machine is on the high side, the strength is not enough, move the storing chute to low position, and match with elevating machine, feed the work piece into grinding machine with timing. The working process are as follows: put 180kg stainless steel ball into grinding machine, the elevating machine according to setting time, feed some Return Bender into grinding machine, confect clean out fluid, through injector, dilute the cleaning lotion with the follow of tap water, clean while grinding. When it is set time (about 20minutes),the cylinder will open the bar door on the machine automatically, and the minor elbow get into vibrating loading machine, the small grains drop from the bar and continue to be used in the grinding machine. There are hot fans on vibrating loader, the minor elbows rotate , vibrate and been dried then been discharged through the ruidmental stainless ball in the material way. Looking for ideal Return Bending Cleaning Machine Manufacturer & supplier ? We have a wide selection at great prices to help you get creative. All the Return Bender Clean Machine are quality guaranteed. We are manufacturer Return Bender Clean Machine in China. If you have any question, please feel free to contact us.